Space Opera, I think, is wild. Really wild. You just won’t believe how strangely, weirdly, mind-bogglingly wild it is. I mean, you may think it was wild when Finnish heavy metal dudes in monster costumes won a continent-wide contest with “Chanson” in the name, but that’s just peanuts to Space Opera. After a while the style settles down a bit and the book starts telling you things that you actually need to know like how it’s all down to cows in the end and how becoming Englishblokeman confers immunity to abnormality. The Sentience Wars turned, in Valente’s memorable phrase, on who was people and who was meat. “Yet this meat had ships. Yet they had planets. Yet, when you pricked them, they rained down ultraviolet apocalyptic hellfire on all your nice, tidy moons. Yet this meat thought it was people and that the great and ancient societies of the Milky Way were nothing but a plate of ground chuck. It made no sense. The sentient peoples of the galaxy decide, much like Earth’s European nations did in the aftermath of World War II, to hold a song contest. Once every arbitrarily defined time period, a representative of each sentient species performs a song for the assembled and broadcast audience in a celebration of diversity and a mass of artistic-political voting that determines shares of galactic resources. For newly contacted species however, the stakes are a bit higher. They must convince galactic society that they are people. If they fail the test by coming in last in the competition, the other species wipe them out and evolution on that planet gets to try again, thanks for playing, consolation prizes on your way out. At a time in the near future, when David Bowie’s memory is alive but Yoko Ono herself is not, it’s humanity’s turn. First contact occurs for everyone simultaneously when a projected image that looks a lot like the Road Runner appears one Tuesday afternoon and explains the rules of the galactic game to humanity. The aliens have been listening to our radio waves for a century or so, and now is the time for our debut. They have also chosen our representatives: “a leggy psychedelic ambidextrous omnisexual gendersplat glitterpunk financially punch-drunk ethnically ambitious glamrock messiah by the name of Danesh Jalo” whose stage name is Decibel Jones and whose backup band are the Absolute Zeros — “drummer, serial keyboard assaulter, and ‘girlfraud’ Mira Wonderful Star and instantaneously gratifying man-of-all-instruments ‘boyfrack’ Oort St. Ultraviolet.” (Ch. 2) Which is unfortunate for a number of reasons, not least that Mira died fifteen years previous in a car wreck, and Decibel and Oort can no longer stand each other. Eurovision in Space, for all of Earth’s marbles. Valente takes the bouncing disco ball of the story back and forth, filling in the story of the meteoric career of Decibel and the Zeros, sketching various other species and the previous iterations of the Galactic Grand Prix, and generally discoursing on the nature of life, the universe, and various other things. As has happened to me with other Valente books, I got close to wildness overload about a third of the way through, but I persevered, and I am glad that I did. Some of my favorite passages came from the book’s only relatively quiet parts. Decibel and Oort are on their way to the site of the next Grand Prix. “It takes eleven days, give or take, to reach Litost from Earth via paradox-fueled aquarium.” (Ch. 18) That’s how long the two of them to come up with an original song that will save humanity, or at least put off its destruction by outside forces and leave time to see if humanity can stave off auto-destruction. Valente shows their attempts at artistic creation through the eyes of Oort’s cat, who sees their efforts periodically in the unimportant times between naps. 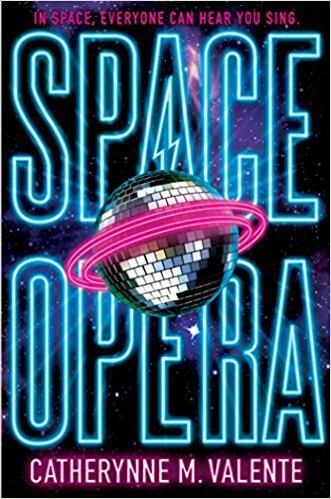 The characters show more of themselves in this snapshots than they do in other bits of narration where Valente is telling readers how glamorous Dess is, how proficient and yet down-to-earth Oort is. I’ll have to look at some of her other books to find out if she does quiet for more than a few pages at a time; I have a feeling I would quite like it if she does. There’s not much quiet in Space Opera, and rightly so, not least because the friendly Road Runner who transported Decibel and Oort thousands of light years beyond that particular cloud neglected to mention that preventing another species’ act from performing on stage, whether by hook or by crook, is an accepted part of the competition. They are left on their own at a pre-show party where keeping a close eye on their drink is only the simplest precaution they can take, and probably not the most effective. The ending, of course, is a show-stopper. How could it be otherwise? I’ll be reading this soon too, and can’t wait to compare notes! Also, I have finished Lovecraft Country, just not entirely sure when I will be writing about it. Ooh, I look forward to reading your review when you do!